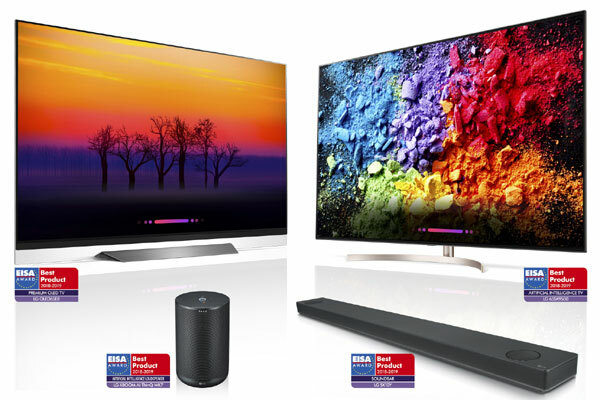 LG Electronics’ latest innovations in AI technology and design have earned the company recognition from the European Imaging and Sound Association (EISA). LG’s AI ThinQ-enabled products including LG OLED TV, LG Super UHD TV and LG XBoom were honoured for their high competitiveness in categories assessing premium picture quality, artificial intelligence performance and sound excellence, said a statement from the company. The LG OLED TV AI ThinQ (model OLED65E8) was named the EISA Premium OLED TV 2018-2019, marking this the seventh consecutive win for the company’s OLED technology, it said. The TV was recognised for its picture quality powered by the a (Alpha) 9 processor, which provides true-to-life images with incredibly rich colours, sharpness and depth for more realism and its class-leading artificial intelligence functionality, it added. The EISA jury also praised the Dolby Atmos performance and its front firing speakers which produce the most immersive audio-visual experience possible. The picture-on-glass design was also cited for perfectly blending into any environment, said a statement. In addition, the LG Super UHD TV AI ThinQ (model 65SK9500) was recognised as the EISA Artificial Intelligence TV 2018-2019 for producing the ultimate LCD TV picture through the combination of technologies including Nano Cell, Full-Array Local Dimming (FALD) and the a (Alpha) 7 processor, as well as LG’s AI ThinQ platform and Google Assistant built in. With LG’s proprietary AI ThinQ, users can control the TV, connect easily to external devices, switch picture mode and search for content. The latest advanced voice assistant technology embedded in the TV is achieved by employing natural language processing (NLP) to deliver intelligent voice-activated control and connectivity based on LG’s exclusive deep learning technology, it said. And with the Google Assistant built in, LG’s AI TVs offer a streamlined experience that allows them to manage different tasks, find answers, or control smart home devices, serving as the centre of the smart home. LG’s Super UHD TV offers denser backlighting zones throughout the display and significantly improves black levels and picture dimensions through independent control of LED light zones. This delivers better shadow details and reduces light bleeding for enhanced local contrast, important for viewing HDR content. Thanks to the innovative Nano Cell Display, TV viewers can enjoy superb colour accuracy and consistency at wide viewing angles without compromising picture quality. EISA also named LG’s premium AI speaker, the LG XBoom AI ThinQ (model WK7), as its EISA Artificial Intelligence Loudspeaker 2018-2019 thanks to extraordinary sound quality combined with intelligence, said a statement. The technical collaboration with Meridian, the British pioneer of high resolution audio, enables LG XBoom AI ThinQ’s full audio performance to be unleashed for high-fidelity sound, precise vocal definition and accurate bass. The device’s high resolution audio is compatible with high quality lossless files, allowing it to faithfully recreate sounds originally recorded in the studio, it said. With Google Assistant integrated directly into the device for quick setup, LG XBoom AI ThinQ responds to a user’s commands without the need for a remote control or smartphone like “Hey Google, what’s my schedule today”. As a hub, the speaker can control Google Assistant-enabled smart home devices as well as LG home appliances compatible with LG ThinQ. The winner of the EISA Soundbar 2018-2019 award, model LG SK10Y, is an immersive soundbar with 550W of powerful output and 5.1.2 channel support by harnessing the power of Dolby Atmos to produce an immersive sound from all directions, including the ceiling, it added. With Meridian technology, the soundbar boasts a high level of performance to envelop listeners in rich, uncompromising sound and delivers extra clarity to speech and music. The device is compatible with high-quality lossless audio files to perfectly recreate sound recorded in the studio and also offers a sound upconverting feature that boosts the quality of standard audio files to 24bit/192kHz to enhance subtle details and nuances of each track. This high resolution soundbar is aesthetically designed to fit under LG premium TVs. Moreover, the soundbar is compatible with other smart devices that support Chromecast and can stream songs or podcasts simply with the words, “OK Google”.